Amy Bickford ~ 'Path to Ferry Beach' ~ Gouache on Gesso Board 9" x 12"
PORTLAND, Maine - June 8, 2018 - PRLog -- Richard Boyd Art Gallery is pleased to announce the opening of a solo exhibition of paintings by Amy Bickford on Wednesday, August 1 at 10:00 a.m. with a meet the artist reception to follow on the 4th. A year-round resident of New Gloucester, Maine Amy creates paintings in a traditional style that are her interpretation of the timeless beauty and essence of Maine. Whether depicting a landscape or a familiar coastal scene, Amy's paintings are a response to the experience and to every-day life. The public is invited to meet Amy at a reception at Richard Boyd Art Gallery Saturday, August 4th between the hours of 12:00 noon and 3:00 p.m. when she will be available to discuss her paintings. Amy Bickford: A Solo Exhibition of Paintings is open free of charge between the hours of 10:00 a.m. and 5:00 p.m. daily through August 30, 2018. When asked about her career as a commercial and fine artist Amy replied, "I graduated from the Maine College of Art (MECA) in 1983. Since graduating, I've held a variety of jobs while continuing to create works of visual art for individual clients, corporations, and small businesses, including painting murals for the Children's Museum of Art in Portland and recreating the artworks on the ceiling of St. John's Cathedral in Bangor, Maine. The abundant and often random beauty throughout the state of Maine has been a constant source of inspiration for my work. 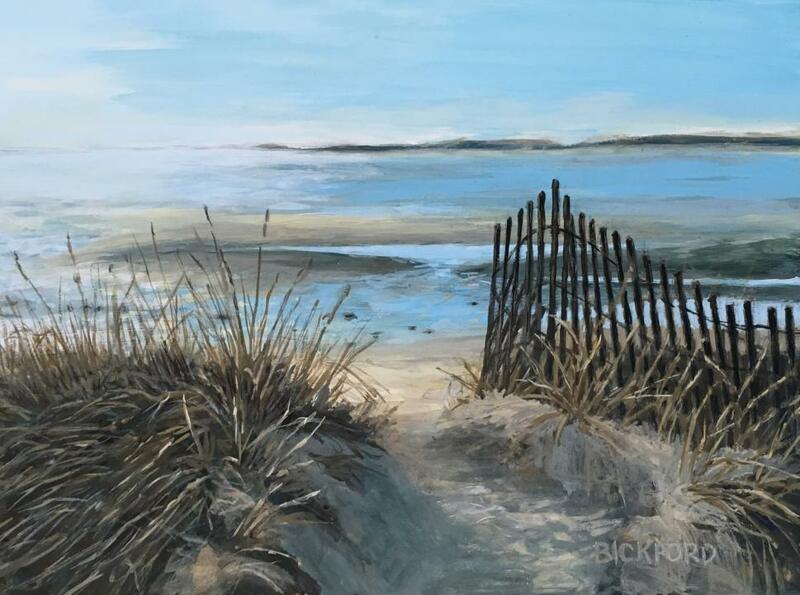 Old brick buildings, birch trees and seascapes spark my interest, but sometimes something as simple as a fence on the beach grass that I've strolled by dozens of times will call out to me to paint it. I create paintings in my studio using drawings and photographs as references to help me see beyond the physical attributes of the scene and capture my interpretation of the beauty of that place in time. I prefer painting with gouache, but use a variety of mediums, selecting the medium that bests helps me interpret the scene. My goal is to create a painting that makes the viewer relate to it on a personal level." Richard Boyd Art Gallery is located on Peaks Island in Portland, ME at the corner of Island Avenue and Epps Street. The gallery represents a diverse group of established and emerging artists with a connection to the state of Maine, creating original works of visual art in a broad range of styles from contemporary to traditional realism. Exhibitions change monthly and include solo, group, and theme exhibits, so clients and visitors always discover something new and exciting when visiting the gallery. During the months of April through October the gallery is open free of charge between the hours of 10:00 a.m. and 5:00 p.m. daily. From November through the end of March the gallery is open free of charge between the hours of 10:00 a.m. and 3:00 p.m. every Friday, Saturday, and Sunday. Additional days and times by chance or scheduled by appointment. For more information about the exhibition or reception contact the gallery by phone at (207)-712-1097, via email at info@richardboydartgallery.com or visit the gallery's website at http://www.richardboydartgallery.com . Like us on Facebook at http://www.facebook.com/RichardBoydArtGallery .